For training purposes they provide an easy setup for someone new to experiment and become familiar with programming without having to worry about interrupting production. Engineers and programmers can test out new functionality and debug many errors beforehand and thus save critical downtime. Maintenance personnel can use the units to test the functionality of suspect parts removed from an installation or to setup new parts before applying them in the field. Parts can be used for backup stock in case of emergency. Feel free to contact me for customization, pricing and delivery. The following cases are now immediately available for purchase on eBay. This Siemens S7-300 PLC Trainer shows how easy it is to build a trainer or development stand using our DIN rail mounted PLC simulators. You won't find a better setup. Consider the advantages. 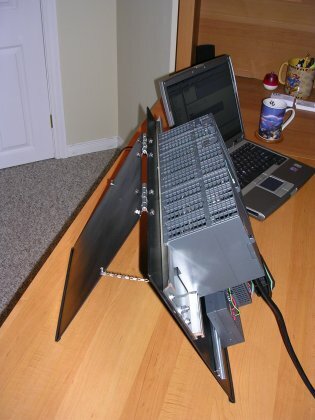 The stand is made of 1/8" aluminum which makes it sturdy yet lightweight. The simulators mount below on a din-rail making it a fully self contained unit. You can easily move it to other locations or class rooms. There is plenty of room on the din-rail for other components. 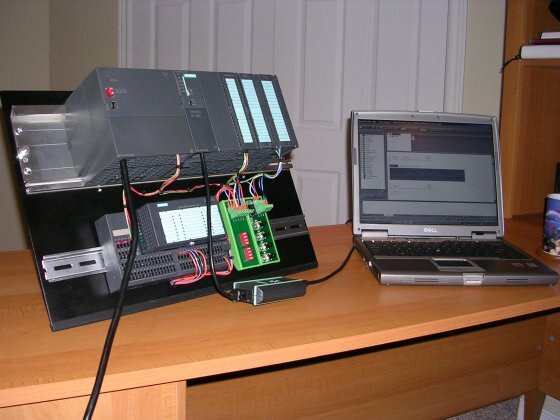 Other devices such as an HMI or pneumatic system can easily be mounted on another stand and integrated with the PLC. The stand has a rubber lining on the bottom to prevent slipping. This makes it easy for the students to actually work on the PLC. The particular demo stand consists of an Siemens S7-300 with a power supply (PS 307), CPU (CPU313C-2 DP) with integrated digital I/O, and an analog input card (SM331). 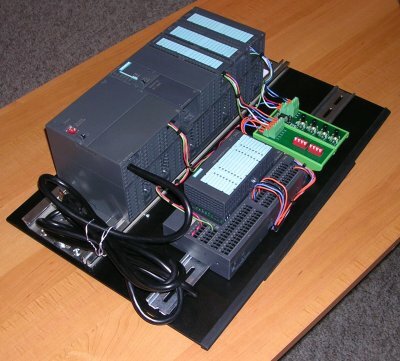 The plc simulators are mounted on the din rail below. The digital input simulator (DI-8-UM) controls the inputs to the input card. The analog input simulator (AD-4-V-UM) provides the signals for the analog inputs. This stand also has a remote terminal block (TB32L and ET 200L) to provide instruction on Profibus. There is also an Allen Bradley SLC-500 Trainer. 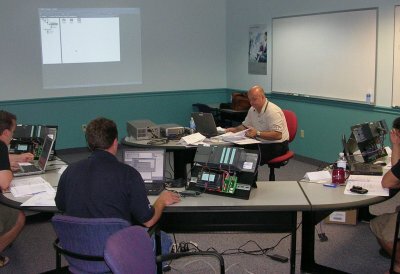 The S7-300 stands used in a training class.